Recently I got my Tomica G. The Gelände. And it’s nice to see the difference with how a SUV has evolved when you put a more recent one next to it. 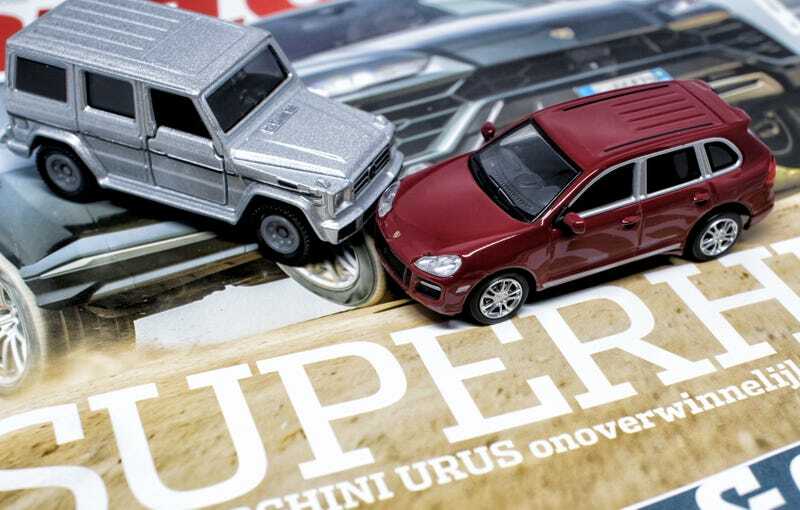 I don’t have MLs or something so I’m gettin out one of the few 1/64 SUVs I have: Minichamps Porsche Cayenne GTS. When Minichamps had their 1/64 scale line many were sold out quickly. Their Cayenne though was a pegwarmer, I eventually got it for I think 2 euros. While they started at 10. Tomicas G won’t get to that I feel as the Gelände still is going strong. I’ve told about it before and it still is some sort of Guilty Pleasure for me. I’d never mind driving that daily. I’d even prefer the old school proper ones, with a diesel please. The Cayenne however... I have a friend owning a GTS and believe me: It’s a great drive. But. I. Will. Never. Get. One. Too much for me. An me waiting for the 1/64 to drop below 2.50 euros says it all actually: I got most of the other Minichamps64 without even blinking an eye when I saw ‘m. Und das war es wieder actually. I applaud Tomica to come up with a decent G and I really hope Minichamps re-enters the 1/64 market soon.